Amsterdam and Nottingham are two very different cities. One of the few things they have in common is an old city centre with lots of brownstone buildings. 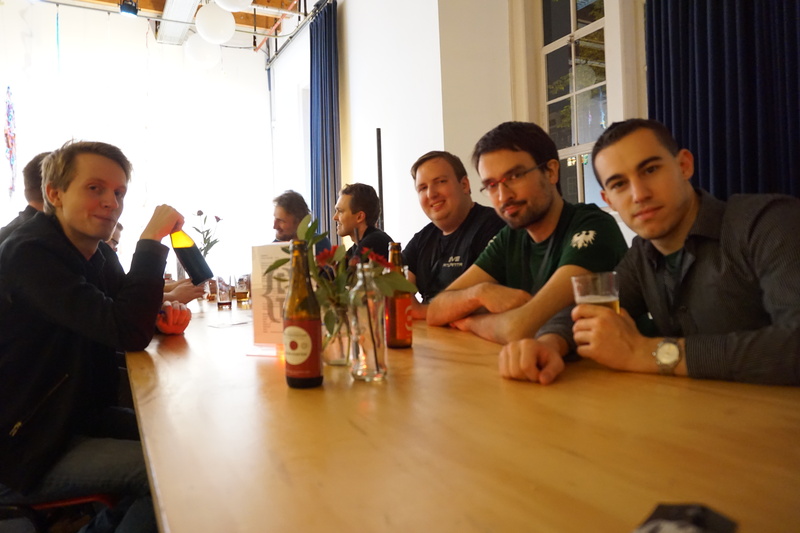 Just as those two history-laden places differ from each other, so do the player meetups which are hosted there by dedicated community members. I spent two consecutive weekends at those gatherings of a peculiar demographic that Zero Punctuation once described as “[being] to nerds what nerds are to normal people”, and I enjoyed it a lot. Just like with the cities themselves, that is where the similarities end. I am not a follower of sporting events, but #EVE_NT felt to me like I imagine a bunch of football fans must feel like when they gather in their favorite sports bar to watch the world championship matches for a whole day on a massive screen. You have probably read my colleagues’ report but I will add a few personal impressions of mine here to establish the contrast with EVEsterdam. 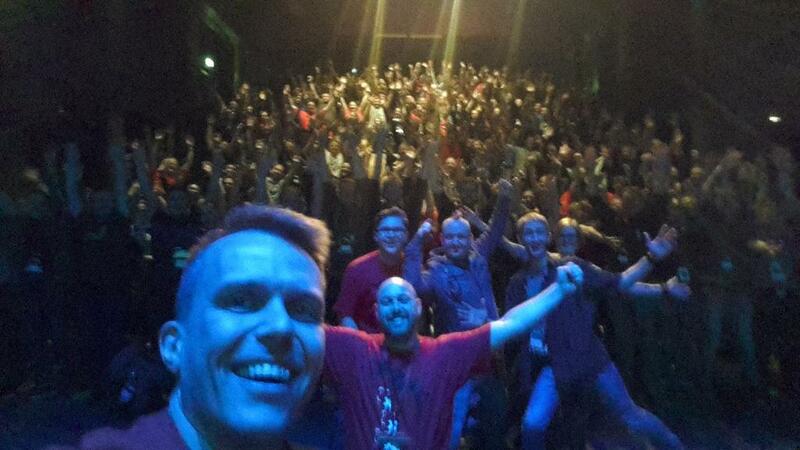 #EVE_NT was an in-crowd meeting right up my alley (not literally). A large number of the attendants were from a lowsec and/or small-gang background. Even if I hadn’t known a single person at that event, I would have met more than enough who I know from our alliance killboard. That’s one of the things I like about lowsec: After a time you come to know those guys in a way not unlike the members of rival gangs in a dystopian inner-city turf war are familiar with each other. The Cidade de Deus of EVE (if you never saw that movie, go watch it at the next opportunity to see a real-world equivalent of EVE, based on true events). Of course it was also great to hang out with a good part of the Crossing Zebras crew. EVEsterdam was by contrast much closer to my daily life in many ways. As someone who works in academia, I am very familiar with the format. You go to a semi public place with scores of people more-or-less involved in the same thing. There you attend presentations which can range from mildly interesting to eye-opening and in between you talk with a selection of those like-minded people about what you just heard and saw. Banter and experience is exchanged and lunches are had, then we proceed to the next presentation. After the official part is over, everybody drinks too much and more networking, banter, brainstorming, experience sharing and socialising happens in various restaurants and bars. Of course, I also had my in-crowd there in the form of a good GalMil contingent, but apart from that, EVEsterdam attracts a different community. As I mentioned in my review of last year, the prominent Provibloc member and former CSM member Corebloodbrothers is Dutch and it appears that there is a significant Provi contingent in Germany as well. You get to see quite a few of those guys there. 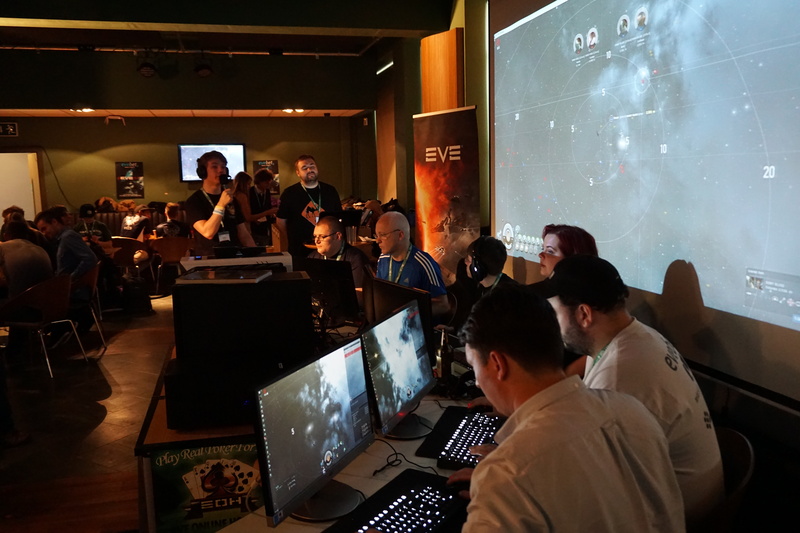 Generally the attendance of EVEsterdam is less skewed to a particular playstyle crowd, and that means nullsec is much more represented but you also get to see highsec gankers, industrialists, traders and other people from different regions of EVE. 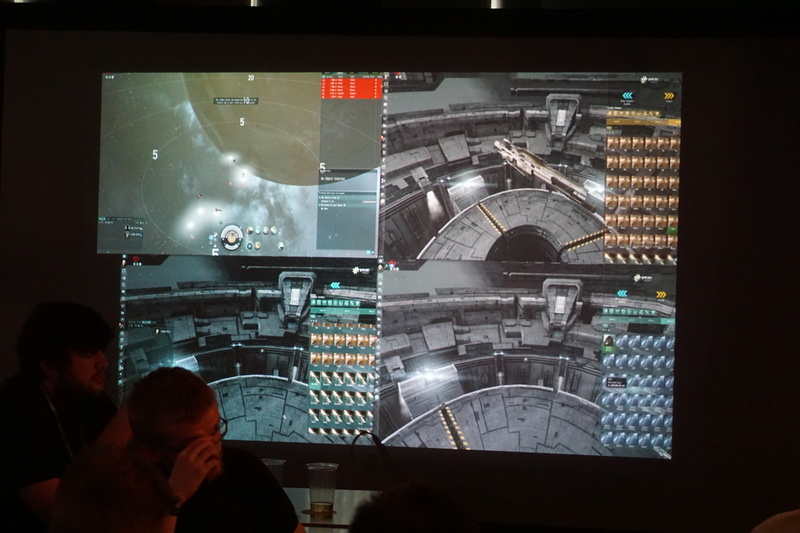 The fact that Mr. Vee of Goonswarm gave a presentation probably also resulted in more sov-nullsec players visiting. Like the academic conferences I regularly go to, this offers a lot of potential for interesting conversations which introduce me to new viewpoints and perspectives. I like that. But, oh man did I enjoy being the football fan in the sports bar. Drinking, eating, socialising, cheering for your favorite team, bonding with others when they win or lose, watching your favorite competition involving exploding spaceships on a big screen with great live commentators. It was a visceral experience. In between you might try Valkyrie or Gunjack, or go get some fresh air, because the place was a bit overbooked. A very nice touch to the tournament setup was the one display off to the side at a lounge area. There you could see the perspective of all four combatants on a split screen. Positioned correctly you could watch both the match and that screen. That gave you more insight into the tournament than the contestants themselves had because they obviously did not know which ships the other party would bring or how they would be fit exactly, although there were strict limitations. If there is one thing I regret about this event then it was not entering myself into the tournament, but I had expected to be needed for the CZ-TV broadcast so I didn’t. EVEsterdam has different qualities. You get to see player presentations that are just amazing. Two members of Razor Alliance who I also met at Fanfest did the first feature on Sunday morning and it was absolutely worth getting out of bed for, despite the hangover. The day before, I had complained about presentations that have a rather dry subject matter and do not manage to make it captivating. As a teacher I stick to the rule that the more difficult your subject matter is, the better you have to present it. Those guys did a great job. It is no small feat to explain basic economics and then correlate the PLEX prices with geopolitics at 11:00 on a Sunday morning and make the attending crowd laugh and clap throughout. Listening to Andrew Groen doing his nullsec history talk is also a pleasure and to quote an alliance mate who really only cares about his small gang and solo PVP: “I could have listened to another two hours of that.” Mr. Vee’s presentation at the end of the day was also great. Often if you get a presentation by someone as prominent who comes from a powerful alliance, it features a combination of smugness, self-referential gravitas and a dose of false self-depreciation. Mr. Vee took a very personal approach for his presentation though which would probably surprise many of the “Grrr Goons” faction. That being said, I really didn’t understand the scheduling. Maybe it is just my taste in lectures, but I got the impression that the best lectures were on Sunday. By that time many people had left because of time constraints and travel arrangements. Our loot-fairy Bobmon had serious difficulty drawing names of people for the raffles who had not already departed on the second day. Maybe the anticipation was that people get more drunk on the first night and need to mellow out on Saturday, but as I said, many missed the really great presentations on Sunday because they already had to leave. In the end, each one of those player gatherings has its own atmosphere that is highly unique, and there are different things one can enjoy about each. That diversity is great, especially with two events so close together geographically. That way you get some great moments like Nashh Kadavr visiting my hometown just a week after I visited his, and this time he could just enjoy it as a guest instead of stressing around all day. To Nihilaus Vause my alliance mate who jumped out of bed at 09:00 in the morning on a Sunday to ride one hour to Nottingham and take me to Birmingham airport at a time that British rail services wouldn’t. To Nashh Kadavr for setting up an EVE player event that truly made me experience something I usually don’t. Also for being on the ball all the time and remaining a gracious host despite the hard work. To his wife who supported him throughout. To Nashh’s son who gave me official permission to talk to his mum. To the two men from Razor Alliance who are EVE obsessed social-science academics like me and did a great presentation. To the one half of The Learning Cliff podcast crew who was a great guy and does half of the great work for their show. To Bobmon who was also at both events and is just a great community-minded person who also supports EVEsterdam with his volunteer work. To CCP Foxfour who talks to me like we are old mates and I am not even sure why. I just reciprocated because he is super funny and nice. To Julianus Soter, the GMVA alliance leader who always takes good care of his crazy Galmil friends. To Tiberius Stargazer who is a cool bro, a true gentleman and awesome drinking companion. To Oreamnos Amric I have a really strange and special relationship with and to his wife who bravely agreed to come with him into this nerd den. To Apothne who is just as cute IRL as he is on video and a wonderfully enthusiastic match commentator. To Niden and Xander for spending a whole day in a studio to produce a great show while others just hang out. To General Stargazer who is always a pleasure to converse with and who had a great revelation about something that will make lore-geeks extremely happy. To CCP Fozzie for his alliance tournament history presentation and for being at EVEsterdam too, and because the man needs some love after this summer. To Deirdre Vaal for starting EVEsterdam. To Nariyu who is the most British non-British person I ever met and shares my enthusiasm for great beers. To the German Galmil contingent who were amazing company at FanFest and were again now. To the guys who once were in BrickSquad and are now in The Bastards. They just have such a great PvP attitude. To Zexxi Purple for doing his best to move around town with an injured foot. To Drechlas who made me realise that there is more to SMA than just a bunch of nullbears. To the cocktail mixing boy at Antenna. It was great to watch him do his work. To Gorski Car who traveled directly from the CSM summit to EVE_NT. To the technical crew at EVE_NT who worked tirelessly to run the day-long tournament. To all the Crossing Zebras crew and to everyone who I have forgotten to mention now but who made both player events great experiences to be at.